Blog Tour For Undercover begins April 1! Thank you for joining me on this exciting trip. If you stick around this week, on Thursday you will find I will a special treat for all of you. Sorry for the self imposed blog silence... My boys began their spring baseball season and it has been a tricky balance of day job, writing, baseball and things like cooking dinner and cleaning the house! I love watching my boys play ball so it is not a complaint by any means. Just an explanation to let you all know where I have been. The boys play at two different levels. My younger one is new to the concept of what we call "kid pitch" where their peers, who are just learning to control a pitch, throw the ball for them to hit. Prior to this it was a very structured coach pitch game with little chance of injury. He is adjusting but my once hard hitter has had a little trouble connecting with the ball. He feels good about the coaches this year though so I am sure he will do great. The older boy is an old pro at kid pitch. At the ripe old age of twelve, the boys are looking, throwing and hitting more like men than little boys and they play an intensive defense. Action packed for sure! His team had their first preseason scrimmage this past weekend they did extremely well. Ia m looking forward to an exciting season. If you have never caught a little league game, I highly recommend it. The boys work hard and they love an audience. You are guaranteed to have a good time. All of that being said, as of tomorrow I will be one week away from my new release Undercover In Six Inch Stilettos. It is the first book in an exciting mystery/romance series involving a group of police wives caught up in little secrets that when they are discovered, can jeopardize their marriages and their lives. This book is full of humor and action and even some great music! I hope you will check it out. Next week I will be hosting a series of events and even a giveaway or two in preparation for release day on April 3rd. I hope you will stop on by and join us in the fun here or on Facebook or Twitter. More information to come! Guess who finally joined the Twittersphere? That's right- @CarolynLaRoche is now out there getting her Tweet on! Stop by and say hello anytime. I am still learning the ins and outs but it's been fun getting to know new people. Baseball season started for my boys this week. we are much busier than we used to be but I am still finding time to start a new series. More information to come later. 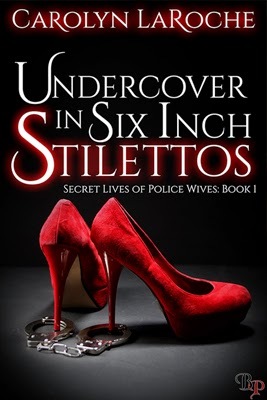 In about three weeks my new book Undercover In Six Inch Stilettos is set to be released. April 3 is the big day! As soon as pre-orders become available, I will post a link. I'll provide links to the blog tour as well, once that is set in stone. I am so excited about this book. I had a lot of fun writing it and it kicks off my new series, The Secret Lives of Police Wives where a group of women married to cops always seem to find a little trouble on their own. The second book in the series In The Shadow of the Shield was accepted by my publisher earlier this week and will be available later this year. Even a cop's wife has secrets… When young exotic dancers start disappearing, can Cyndi find the missing girls without exposing her own little secret? Cyndi Mills has a great life. A handsome husband that desires her, a beautiful daughter, and friends she could trust with her life. It's only logical that she secretly takes a job as an exotic dancer at one of Virginia Beach's night clubs. When dancers start disappearing, Cyndi is determined to get to the bottom of it. Unfortunately, solving the case means her overly protective husband has to know that she has been lying to him for months about where she goes every Friday night. Cyndi has no idea just how deep she will get by going undercover as a confidential informant. Will she risk her marriage to find justice? Jason leaned against the counter, arms folded across his chest. She recognized that look immediately. He was doing the cop thing, analyzing her, and she could tell he knew something didn't add up. His left eyebrow rose just a tad higher than the right as he studied her. "Why do you have glitter in your hair?" Cyndi shook her hair and a shower of glitter rained down on her sweatshirt. Damn. Somehow she had missed a boat load of sparkle. Damn, that stuff got everywhere. "Jody brought her daughter's costume for a dance recital to work so I could help her fix a tear. It was all covered in sparkles. The damn stuff got on everything. Had to go back over the carpets with the sweeper twice and I'm still not sure we got it all." Jason continued to stare down at her from his full six feet of height. His stare was laser sharp, his presence imposing. It was no wonder he was so good at catching the bad guy. Hardened criminals squirmed under the intensity of that stare. Hopefully he couldn't see through her despite the fact she felt as transparent as the shower curtain hanging in their bathroom. "You think Harper is going to want to do that stuff?" "Harper is four. It's a little early to predict if she will be a dancer or a swimmer or...whatever." "Yeah, well, I just don't want that glittery stuff all over the house. The guys won't ever let me live it down, I show up to work all sparkly like that." He shook his head. Cyndi stepped closer to her husband and wrapped her arms around him. "I'm exhausted, honey. How about we go to bed?" Jason hugged her close. "You gonna wear a little French maid's outfit like you do when you clean those offices?" "Can't fault a guy for trying." Jason's grin was a sharp contrast to his earlier scrutiny. He pulled out the neckline of her top and peered down into it. "Come on. I know you gotta wear some kinda uniform!" Thank God she had changed in to her old white bra from the discount store and left her bustier at work. Stepping back, Cyndi held her arms out and spun around slowly. "You're looking at it, baby. Doesn't my ratty old sweatshirt turn you on?" "Not as much as a little maid's outfit would. It's nearly Halloween. Maybe I ought to pick one up for you to wear at work. You know, so you don't mess up your own clothes." "Ohhh, Jason... you are such a guy!" "You would rather I be such a girl?" "Of course, not! Just don't be so obvious about being a man all the time." Cyndi filled a glass of water from the tap, drank it in one gulp, then placed her used cup in the sink before heading toward their bedroom. "Come on, cop man. You play your cards right I might let you frisk me before we go to sleep." Cyndi heard light switches flip, door chains sliding and the announcement that the house emergency alarm was being set. Jason rushed through his nightly round of safety checks as he yelled to her from various locations around the house. "Do you have anything on you that might hurt me?" Snap went the deadbolt on the front door. "Needles, knives, or guns?" Click went the security latch on the sliding door to the back yard. "Do I need gloves or cuffs...?" "Not sure you're gonna need gloves but cuffs might be fun," she called back as she climbed out of her clothes and dropped into the cool sheets. Spring is Finally on the Horizon! After nearly two weeks of snow and ice and being home from work/school, things are finally looking up. The boys start baseball this week. The sun is shining and I hear it might be warm enough to wear sandals later this week. Maybe. The unscheduled vacation was helpful. We used the time to move our oldest son into his own room. After emptying the room, painting it and starting to move things back in, I am excited to see it all come together for both of them. Know what else I am getting really excited about? In just four weeks, my second book Undercover in Six Inch Stilettos will be releasing (April 3rd!) in both ebook AND print! I am super excited about this book as it was just so much fun to write. I can't wait for you all to meet police wife Cyndi and her over protective husband, officer Jason Mills. They have a great story to tell with lots action, excitement, humor and romance. Pre-orders should be available soon. When they are, I will place a link here on this blog. I recently completed the second book in the series. I love it as much as this one and can't wait to get started on the third book. As it stands, I have to now get back into the hang of a regular schedule again.